Every individual likes to be his or own boss and handle all affairs of the company and have ultimate control. Starting a business is, of course, not a small thing. Be it an entrepreneur or an individual or a working professional everyone likes to save money. 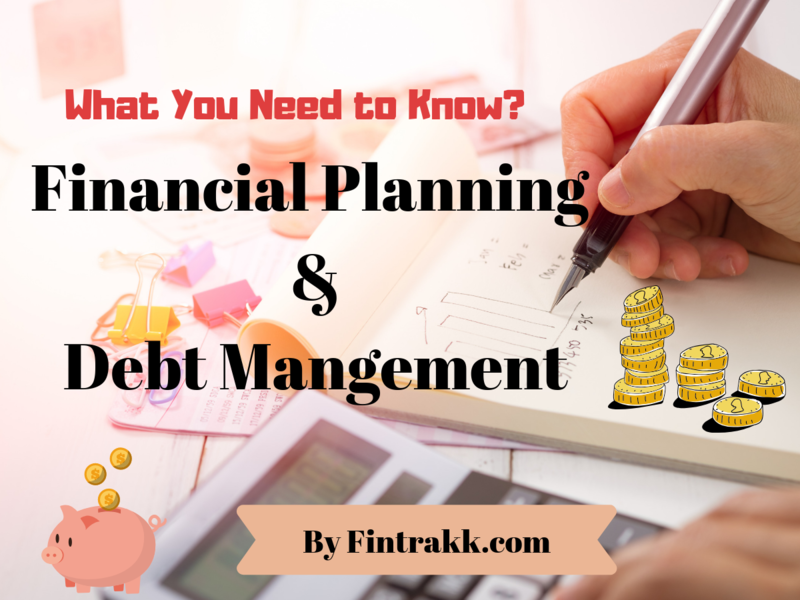 So, here we discuss about Financial Planning & Debt Management, how they are to be handled together. It is rightly said “Earning money is easy, but saving is that difficult”. There are various modes of investment like a mutual fund, SIP, etc. Investment in the right way is utmost important. People often say invest money in mutual funds and you will get good returns. But, for that, we need that much excess money in our hand. Considering, a person is starting a business, let’s say the worth of 100 million for that he or she needs to raise assets like land, capital, and other required constraints. Apparently, for generating assets a person needs to proceed ahead with the investment. What is the source of investment? It can be the person’s own money or the amount borrowed from the bank, which becomes an extra burden. Taking another example of a credit card, a credit card means a type of unsecured debentures. You just cannot ignore it. Investment and debt can affect the financial health of a person. Both need to be balanced in either way. Financial planning is always important, be it a person or a business entity. It is necessary to practice healthy and safe planning with respect to finance and wealth. Below mentioned are the following points which need to take care when we are opting for financial planning. Always try to make such plans which will not only secure your future but be fruitful. There are approximately 90 percent of people in the world who believe in short-term financial planning. Short-term financial planning is nothing but sheltering on a boat which is about to sink. It comes down to break-even point. There is nothing to save. It creates a negative impact on your financial health. ALSO READ The Magical Power of Compounding: How it works? On the other hand, Long-term financial planning makes you prioritize the most significant things. We generally make investment in numerous things. There is no particular time table it. So, as with paying the debts. Firstly, before making any new investment, make sure you have cleared the debts and have reviewed it. Investment is necessary, but it is also justified to fulfil the financial promise as well. Not clearing the debts and focusing on the investment is again a wrong financial decision. Debts can be of any type, and there are varied debt schemes which are available in the market. Never forget, market can’t always be profitable, most of the time it is volatile as well. Make sure you are not drowning with the debentures, and there is no way of escape. Seek proper guidance before opting for the debt. Try to understand what the market is all about. Research and then go ahead. There is always a solution to every problem. Even our medical bills, credit card bills, etc. seem to be a small amount, but these are all debts. Example: A person who relies only on credit card starting from the mid of the month. There are certain factors like inflation may give rise to debt. So, there are different ways which will help us in the planning of investment and debts. Your salary decides the fate of the debt. It is always better to go for a minimum payment option if you feel you cannot make a one-time payment. But, ensure that the relationship manager provides you a certain limit of the same. ALSO READ 5 Financial Planning Tips ! Again, everything has its pros and cons: the minimum option plan can direct you towards high-interest rate. This interest rate is undone, it is compulsory to pay. As we know, nothing comes for free. Hence, it is better to make minimal use of credit cards and stay away from the debt of the credits. When the amount is credited to one of your bank accounts, calculate the necessary debt amount and transfer it to the other bank account. So, that your money is saved and debt is also paid. But, transfer it only if you are sure. Here, do consider the interest rate as well that is the lower interest rate. If one-time payment is not possible; always opt an option of peer to peer transaction. They offer personal loans and credits with a proper fixed interest rate. This will reduce the extra baggage, and you can save a large lump sum amount of money. Family pressure, financial pressure feels like you are under the umbrella of debts. It is recommended to increase your source of income or find a way how you can increase the bank balance. You can opt for freelancing projects and get associated with long-term projects. This can help you save a certain amount even after paying the debts. Or that money or amount can be saved for repaying the future debts as well. It will be foolishness to take additional loans for paying off debt. Then this process will become never-ending. Investment is made for the future or in other words we can say it is done to secure our future. But, where there is an investment, there can be debts. Both, investment planning and debt planning cannot be ignored or denied. It is better to make sure both are served properly. If we don’t opt for an investment plan, it is risky. Whereas if debts are not paid, it will leave us to nowhere: bankruptcy, mortgage, even more, can be the case. Proper financial and debt planning is really crucial. In fact, a perfect and systematic investment plan is highly important to manage finances and have stable financial growth. Hence, it is advisable to save and invest wisely. This is a guest post and not a sponsored one by Daniel Ng, a freelance writer who has been writing for various blogs. He has previously covered an extensive range of topics including business debt consolidation, finance, e-commerce and start-ups.